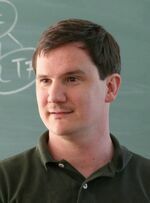 R. Ryan Williams received his Ph.D. from Carnegie Mellon University in 2007, advised by the incomparable Manuel Blum. Up until recently, he lived on the Stanford campus, where marble-sized tomatoes grew on his balcony. Nowadays, he has no balcony and no tomatoes, but at least he can afford a place larger than a closet. He does not understand everyone else's distinction between algorithms and complexity.